New SqueezyMAXPAX™ Stand Up Pouch Developed & Patented by The Barton Group, Inc.
SqueezyMAXPAX™ Stand Up Pouch provides a better option over the current standard gusseted bottom stand-up pouches because it has no gusseted bottom! SqueezyMAXPAX™ Stand Up Pouch will cost less because the flat bottom creates a great volumetric capacity in the same size pouch. The productivity of horizontal thermo-form / fill / seal machines can generate high volume throughput that can exceed the standard gusset pouch volume, saving even more money in the manufacturing and packaging process. 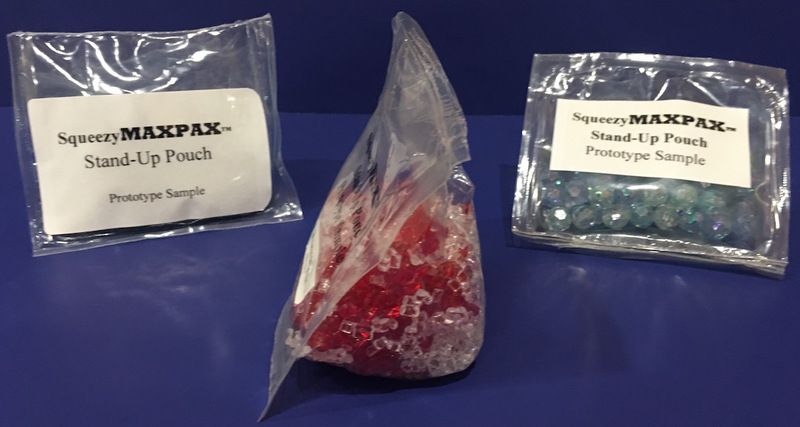 In addition to many other market opportunities and applications, SqueezyMAXPAX™ Stand-Up™ Pouch can be used for dry, free-flowing products such as beans, nuts, granola, candies (hard candies, chocolate chips, chocolate sprinkles, jelly beans, etc. ), soup and gravy and sauce mixes, rice, soap crystals (bubble bath, etc. ), kitty litter, marbles, toys and much more. SqueezyMAXPAX™ Stand-Up™ can also be produced with easy-open and dispensing features such as tear notches, zippers, embedded pour spouts, etc. To learn more and discuss your needs, contact us via these options.